Again, there was heavy rain overnight and the forecast for the day was not promising. 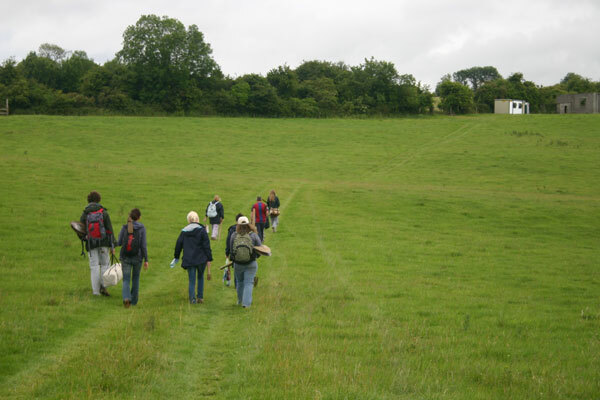 Nonetheless, we arrived down the lane to the cabin as usual to get organised for the day and trekked across the damp fields to the site. The cattle seem to be getting used to us now and don’t bother getting up as we pass. 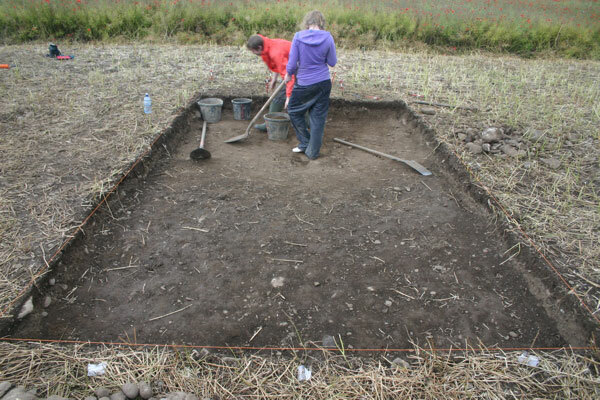 We continued taking down the ploughsoil square by square in each cutting using spades, shovels and mattocks. There is very little trowelling yet, much to the disappointment of some of the volunteers I suspect, but there will be plenty of trowelling to do fairly soon. 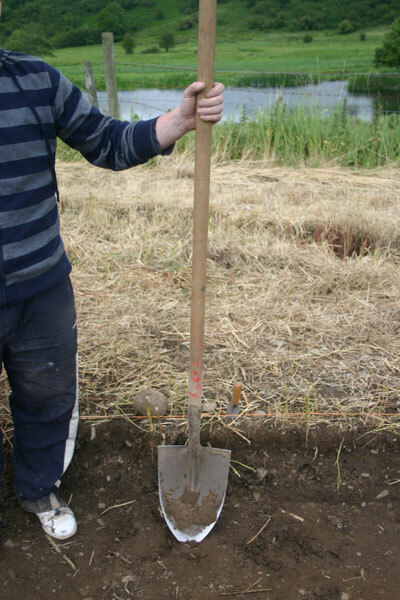 Many people don’t realise that it is probably the mattock and not the trowel that is the quintessential archaeological tool. Certainly, the mattock does a lot more work in terms of the weight of material shifted compared to the trowel. It is not a very common tool – you tend not to see them on the shelves in your local Woodies Hardware store – but they are very useful. 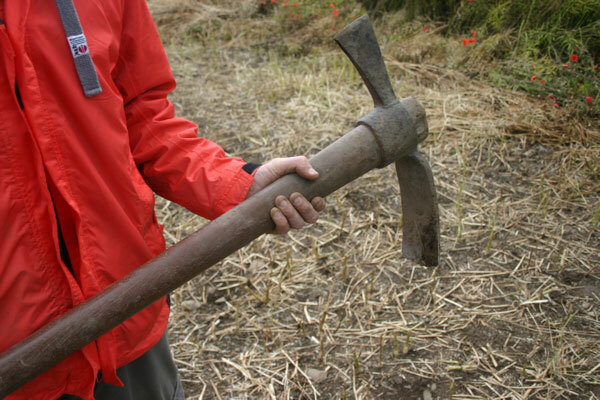 The shovel, probably a more widely recognised tool, is the essential companion to the mattock. Find of the day - a blue glass bead. We continued to collect fiends with flint flakes and flake fragments being relatively common. Animal bone was also turning up, probably indicating occupation and the consumption of meat on the site. 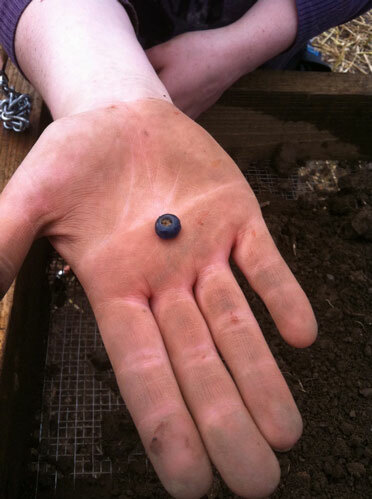 However, the find of the day today, and probably the week, was a lovely intact blue glass bead spotted by Niamh between the roots of a plant while being sieved. 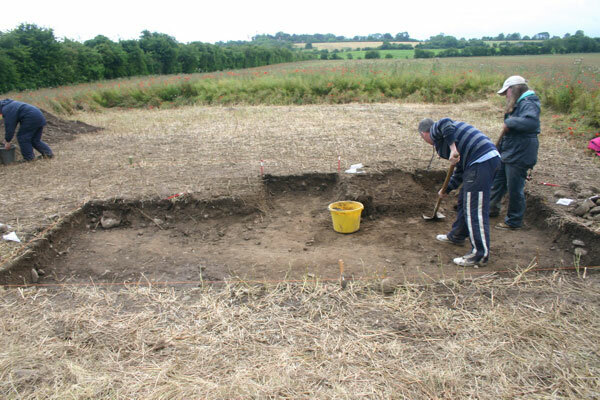 This is an early medieval artefact type rather than prehistoric, but it is no surprise because of what we learned about the site during last year’s dig. 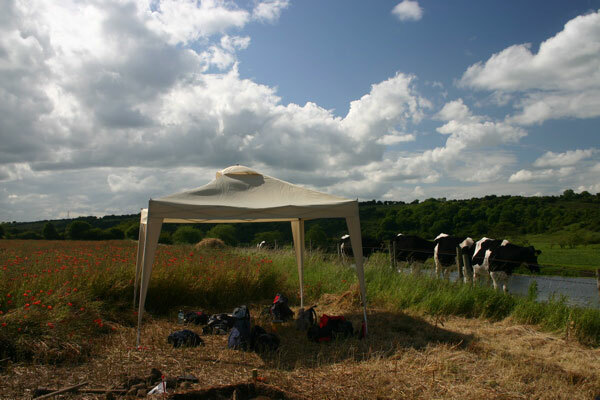 There is still plenty of evidence of Neolithic activity in the flint, and hopefully before long we will also have some Neolithic features as well. The sieves where most of the artefacts are being found. They are really working well and most of the time the soil passes through nicely. 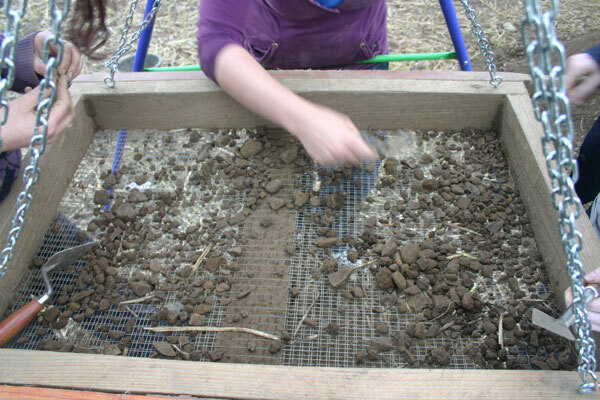 However, after showers, which were frequent this morning, things get a bit more messy and working the sieves becomes a bit more difficult. This effect tends not to last too long as the rain only wets the soil surface – underneath the ground is quite dry – and the soil dries out quickly. Progress so far – Cutting 6. 15 sq m.
Progress so far – Cutting 7. 12 sq m.